Bill Geary is retiring at the end of the month after 40 years with the U.S. Postal Service. 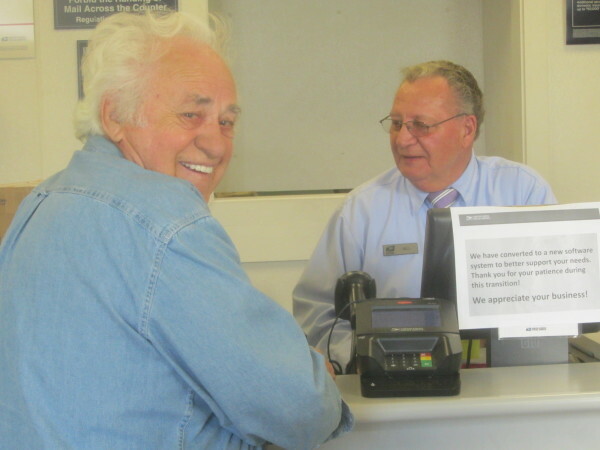 The Rockland Post Office veteran worker is serving customer Thomas Lapointe, who served as city manager for Rockland in the 1960s. ROCKLAND, Maine — Bill Geary has been chased by a pair of angry doberman pinschers and helped mail some odd things over his 40 years with the U.S. Postal Service. But Geary, who will retire June 30, said he has enjoyed the contact with customers over the decades. Geary, 70, was born and raised on the Penobscot Bay island of Vinalhaven. He had worked at a marina that closed and was looking for work when a clerk’s job opened at the island’s post office. He first would have to take a written test in Rockland. On the day of the test, he said he thinks half the islanders were on the ferry, also hoping to land the coveted job. A few weeks later, he was mowing a lawn on the island when the town’s postmaster stopped and gave him the good news that he had scored the highest on the test and got the job. Three months later, a job was available at the post office in Rockland and Geary was hired. When he was delivering mail, there were several times when he has been chased by dogs although he has avoided being bit. One incidence stands out more than others. He was delivering mail to a home on Florence Street during a rainstorm and had put the mail in the box at the door and the homeowner opened the door and out came two dobermans. The work at the counter at the Rockland post office was safer but had some interesting packages have come through. When deliveries of chicks come in, frequently in the spring, the constant peeping sound is noticed by customers who ask if it is a relaxation tape playing. But several years ago, an out-of-state visitor had what Geary said was the most unusual item to be mailed. “He had this large set of moose antlers that he gotten while here. He couldn’t take them on the plane so he wanted to mail it to his home,” Geary said. After considerable discussion among staff, they found a mix of boxes and packing tape to send off the item. A half hour later, the man returned and gave the staff whoopie pies. The two busiest times for the post office are Christmas and tax day, he said. He acknowledged that the customers are in much better moods during the holidays. The lobby closes at 5 p.m. but on tax day, people will knock on the door saying they need to get that day’s post mark on their mailings to the Internal Revenue Service, he said. He celebrated his 70th birthday in April and his oldest son asked him what he was waiting for before he retired. That comment and the offer of a cruise to the Bahamas helped him decide to retire. His son has also offered to get him a dog for his retirement. Geary said he accepted the offer but said that he does not want any dobermans. “Maybe a chihuahua,” he said.